Know about the Caffeine in your tea? We live in a country where our day starts with a cup of tea or a conversation starts with a cup of tea. Tea is offered to every guest who comes at home. 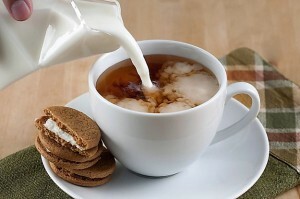 In offices or any workplace, we just grab a cup of tea when we feel tired or exhausted. Tea is the most consumed beverage in India at present. But, is your tea making you healthy or is it making sick? Many Indians have a habit of having tea as soon as they finish their meal. Let me start with saying while there is no harm in consuming tea, when you consume is what matters. Tea contains “CAFFEINE” which is a psychoactive drug. It inhibits calcium, iron, vitamin D, zinc, copper, manganese and many other nutrient absorption. When you consume food along with tea all the micronutrients that are essential for the body are not absorbed and are directly excreted in urine. Milk should be ideally consumed as plain milk without flavours. Evidence also suggests that caffeine may lead to harmful effects on health. It may interact with satiety and is also associated with stress levels in individuals. Caffeine may have an adverse effect on insulin-dependent glucose uptake, irrespective of obesity, type 2 diabetes and exercise, heart rate and blood pressure. The risk of myocardial infarction with caffeine is higher in present or past smokers. Caffeine may increase blood pressure, the risk of negative cardiovascular consequences and may enhance stress responses in men as well as women. If combined with a high dosage of sugar, may cause obesity and overweight. Caffeine can cause insomnia, nervousness and restlessness, stomach irritation, nausea and vomiting, increased heart rate and respiration, and other side effects. This is one of the major reasons 80% of Indian population especially women are osteoporotic. The main reason is they are deficient in calcium and vitamin D. When you mix milk with tea powder you are mixing calcium and anti-calcium ingredient together. Your body requires at least 2 hours to digest your food. An ideal time to consume tea is 2 hours before and 2 hours after you consume your meal. The same implies to coffee or any beverage that contains caffeine. How much caffeine is present in your tea? There are many factors influencing caffeine levels in tea, including brewing time/ temperature, tea grade, and tea varietal. Tisanes or “herbal teas” (including many of Celestial Seasonings’ “teas”) are usually caffeine free. Similarly, teas blended with other ingredients (such as mint green teas or masala chai) will often have lower caffeine levels than unblended teas. Most studies show that black tea has between 40 and 120 mg caffeine per eight-ounce serving. Decaf black tea usually contains about two to ten mg of caffeine. The information below comes from a very interesting article on tea and caffeine by Bruce Richardson, who has been instrumental in debunking caffeine myths surrounding tea. Each seven-ounce cup of tea was steeped for three minutes. Ceylon Black Tea (OP Grade) – 58 mg.
Up to 400 milligrams (mg) of caffeine, a day appears to be safe for a most healthy adult. Bringing desirable change in this habit may make a lot of difference in your health. Zehra Fatima is a lifestyle and fitness coach. She has a masters degree in nutrition and dietetics. As part of her master's programme, she worked on a project on the quality of life and lifestyle modification in diabetic patients. Apart from clinical nutrition, she is also well versed in many forms of exercises, benefits of foods and physiology of food interaction. Her mantra for life is -Do not go on Quantity go on Quality. Thanks Zehra…. The info was useful.. It can be reused for 7 times . We Indians , do not get to taste it . It is sold in the European markets . I love having tea, especially when it’s prepared by my loving wife.